date unknown, but after 1913.
and President of Mexico, 1911-1913. Very few people in Mexico know about Francisco I. Madero's Manual espírita, which I translated into English for the first time as Spiritist Manual on its centennial, 2011. It is true, as I detail in my new book, Metaphysical Odyssey into the Mexican Revolution: Francisco I. Madero and His Secret Book, Spiritist Manual, that some of Madero's political enemies knew about it-- in fact, the Reyistas published "Bhima's" book, unmasking the author, Mexico's president-elect at the time, precisely in order to damage his reputation. As every Mexican schoolchild learns, President Madero, Mexico's "Apostle of Democracy," was murdered in the coup d'etat of 1913. It would seem that the few thousand copies of his Manual espírita then sank into oblivion. 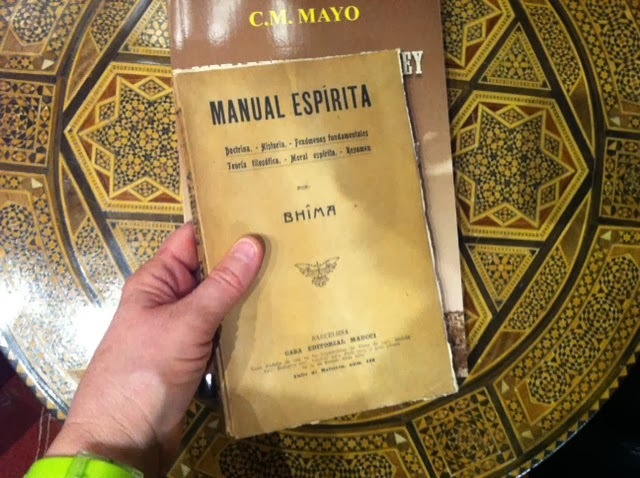 While some Mexican historians-- Enrique Krauze, Yolia Tortolero, Manual Guerra de Luna and Alejandro Rosas, among others-- have written about Madero's Spiritism, it remains a "not ready for prime time subject," and I can tell you it is not easy to find a copy of the Manual espírita. In 2000, Alejandro Rosas brought out the collected works of Madero, including his Manual espírita, but that volume of that series is now scarce. (I did find a copy in a used bookstore in Mexico City, but it took some effort.) Gustavo de Anda published an edition in the 1970s but I have yet to find a copy of that. And, as I lately learned, a very small print run sponsored by the State of Quintano Roo came out in 2000. Bottom line: until 2010, when a Mexican government website commemorating the Revolution of 1910 posted a PDF (as one of a multitude of historical documents), one had to have access to a major library or get into the archives to see it. A copy is in Mexico's Ministry of Finance, which holds the Francisco I. Madero archive; another is in the remains of his personal library in the Centro de Estudios de la Historia de Mexico CARSO in Mexico City. Since I collect rare books, I had an eye out for the 1911 edition of the Manual espirita. Every week or so, I would (and still do) surf onto Google and the rare book dealers websites to look for it. One day, bingo, there it was-- Bhima's Manual espírita, "circa 1900." Apparently the seller did not realize that Bhima was Madero's pseudonym. The price was-- well, let's call it peanuts. So I bought it. Imagine my surprise when I opened the package to find Bhima's Manual espírita, ancient browned paper, the same exact text but slightly different design-- from the Casa Editorial Maucci of Barcelona! Gran medalla de oro en las Exposiciones de Viena de 1903, Madred 1907, Budapest 1907, Londres 1913, París 1913, y gran premio en la de Buenos Aires 1910. So: this places the date of its publication in Spain sometime after 1913. And now I learn, on this Spanish website, Grupo Espírita de la Palma, that there is an edition of Madero's Manual espírita published in Spain in 1924. I suspect, given that Casa Editorial Maucci seemed to be taking medals so frequently, that the 1924 edition was not the one I bought-- I suspect that mine came out earlier, closer to 1913. But that's just a guess. Nonetheless, whether there were one or more editions out of Barcelona, first published closer to 1913 or later, in 1924, the existence of an edition from Spain strongly suggests that Madero's Manual espírita had a wider influence on the Spiritist movement than I or any Mexican historians previously suspected. And there may be more. I understand that Spanish translations of the French Spiritist books (and perhaps also the Manual espírita itself? ), played a key role in bringing Spiritism to the Philippines. It certainly will be interesting to see what turns up. >Watch a 3 minute video about another very rare book, the 1907 translation of Leon Denis' Después de la muerte by Ignacio Mariscal, then Mexico's Foreign Minister, which was sponsored by Francisco I. Madero and his father. >For more about my book, Metaphysical Odyssey into the Mexican Revolution: Francisco I. Madero and His Secret Book, Spiritist Manual, I invite you to visit the webpage. It is now available in both Kindle and paperback. >The Spanish edition, Odisea metafísica hacia la Revolución Mexicana, which includes a reprint of the original Manual espírita, will be available soon. Is now available.